﻿ Modernized by UOP Enterprises T-84 Will Compete in "Tank Challenge 2018"
Modernized by UOP Enterprises T-84 Will Compete in "Tank Challenge 2018"
The Ukrainian troops on the main T-84 military tanks – repaired and upgraded by UKROBORONPROM (UOP) enterprises SE “Malyshev Plant” and the SE "Kharkiv Morozov Machine-Building Design Bureau", will take part in the tank platoon competition “The Strong Europe Tank Challenge 2018″. T-84 and crews have already arrived in Grafenwöhr Training Area, Germany, and the opening of the Tank Challenge 2018 will take place on June 3. Representatives of 8 countries will compete for the title of the best tank platoon. Ukrainian tanks will compete with “Abrams”, “Leclerc” and “Leopard” of various modifications. The main battle tank T-84 is more advanced, compared with the T-64BV, used by Ukrainian crew during international competitions in 2017. The latest developments of the Ukrainian military-industrial complex were used for modernization of this tank. It is a step above its predecessors. The T-84 is a modern vehicle, developed by the SE "Kharkiv Morozov Machine-Building Design Bureau". The T-84 has the latest gunner’s sight, detecting the target "tank" up to 3500 meters, and “infantryman” type target – up to 2,200 meters. Taking into account the 125-mm gun with a loader that allows firing at a rate of 8 rounds per minute, it ensures effective destruction of targets in a minimum amount of time. The T-84 is equipped with 1200-horsepower engine, providing an almost 50-ton tank with specific power of 24,7 horsepower per tonne, which is about one third more than T-64BV and is in line with such tanks as “Abrams” and “Leopard-2”. The T-84 can speed up to 70 km / h when moving forward and – thanks to four reverse gears – with a maximum speed of up to 35 km / h in reverse gear. This allows for quick maneuvers on the battlefield, constantly changing positions without exposing the vulnerable zones of the combat vehicle to the enemy. In addition, the combat vehicle has an auxiliary power unit that feeds the onboard systems, while the tank is stationary. In addition, the T-84 is equipped with a complex of optoelectronic countermeasure complex "Varta" – providing detection of laser irradiation of the tank – and an electro-optical active protection system “Shtora” that can mislead enemy anti-tank missiles. The tank is equipped with high-sensitivity optical fire detectors, instead of temperature sensors. They accelerate the reaction of an automated fire extinguishing system in case of fire inside the tank. This helps to save lives of the crew and increases the survivability of the combat vehicle on the battlefield. T-84 tanks proved their high effectiveness during the practical phase of Combined Resolve X international exercises at the training site near Hohenfels, Bayern, Germany. 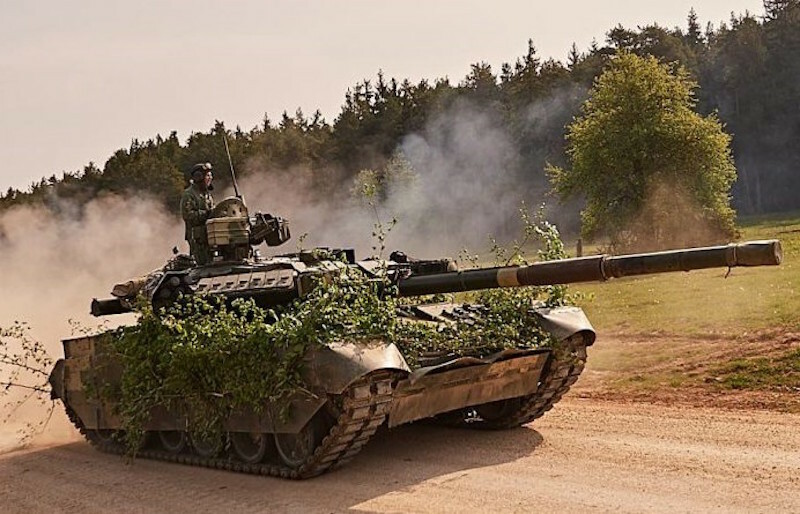 The airborne company of 79 AABr and the tank platoon of 14 SMBr accomplished a march, having several times engaged in battle with hypothetical aggressor, delivering fire from the ambush. During the clashes, several enemy “Abrams” tanks were dead. Without significant losses, the jointed subunit of the Armed Forces of Ukraine managed to reach the point of destination.